The nature of online content means that fresh, new articles take over and older material gets quickly forgotten. This means that content creators need to regularly create new content to keep their audience interested and their traffic consistent. The majority of brands will have content that has been more successful than others, and it is a shame that once time has passed your brilliant content ends up just sitting in your blog archives. Many writers struggle to constantly create engaging and original content that will drive traffic and rocket social mentions, but it doesn’t have to be that way. Repurposing old content is a fantastic way to create new and original pieces while reminding readers of your older articles. 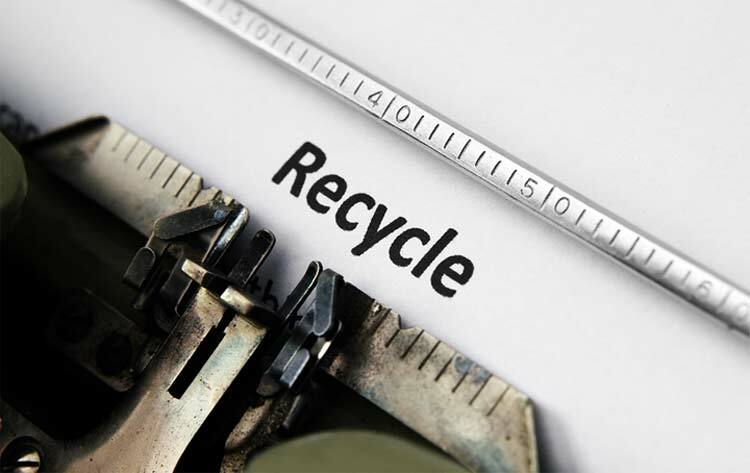 There are many benefits to recycling content, including keyword optimisation and backlink generation, increased audience engagement levels, higher reader retention and better brand authority. Every time you create a new piece of content, you should keep in mind how it could be repurposed further down the line. Think about whether your article could be part of an on-going series, or whether a visual piece of content or app could be re-used throughout the year. Go back through your content and find your best high quality content that has been popular and has received a high level of traffic and social shares – you can do this using Google Analytics. Also think about posts that are now out of date and that could be updated. Many great pieces of content include lists (just like this one). This is a great place to start when it comes to repurposing content. Break down the lists you have created and think about how each point could work as a stand-alone blog post. Not every list-structured post that you have created will work in this way, but you would be surprised to see how many of them will. My post on 5 Ways to Humanise Your Brand on Social Media for example can be broken down to create 5 individual posts in much more detail. This idea can of course be reversed too, and if you have a few different posts that can be combined as part of an overall strategy, this can make a great summary post. Collating all of your blog posts into an e-book is a great idea, or alternatively transcribing a webinar you have previously done and turning it into an e-book can work too. An e-book can be used as a strong, high quality piece of content to grow your traffic and develop a list of subscribers. Go back through your content and decide which posts would fit into your e-book and how they could be structured. Make sure you put some additional content in too though, such as pictures and introductions, as you want to make sure the posts link to each other and work in a book format. Once you have your content for the e-book worked out, give it a great design and then use it however you need to – sell it, give it away for a limited amount of time, include a discount code for your company etc. Newsletters are great for sending to your customers with small snippets of information about your content. If you have a set of articles that can work as a step-by-step guide, then you can send one out a week with a summary to keep your readers interested in what you will send them next. You can also use newsletters to show off your most popular content and send links to articles related to those summarized in your original email to them. Email newsletters are a great way to engage an existing audience, and provide a perfect channel for content promotion. You can use the e-book mentioned above to build a list of newsletter subscribers, but it is also important to have clear call to actions on your site. Use a service like MailChimp to send out and monitor the newsletter and see how many new leads you may end up getting. SlideShare provides a brilliant way to present content and data in a visual and engaging manner. You can use presentations as a way to give your readers a summary of your original content or as a way to present visual data and statistics. If you have a particularly long piece of content such as a whitepaper, you can extract the most important parts and visualize them on a slide. It is important that you re-format your content depending on your audience, so for those who want a short and snappy visual presentation of some data, SlideShare is perfect. Once you have created your presentation you can then link back to the original content. The great thing about a SlideShare presentation is that it is both embeddable and sharable, so it’s easy for readers to include your content on their own sites and share it with their friends and followers. Visual content should be a key part of any content strategy, as it is engaging and easy to digest. There are tons of different ways you can reuse old articles and blog posts and turn them into visual creations. Infographics are a great way to display data and can include quotes and stats from any existing study you have written up. Similarly, individual pictures can be created using quotes and stats and then distributed through various channels. Pinterest is a great place to create boards around different topics. Many people don’t enjoy reading articles, so why not try and turn some of your written content into a video series. Podcasts are also popular and can often use existing content as a start point for a larger discussion. Great content can be used as part of a hub and spoke strategy and really help to develop new content from older pieces. If you have created something great, then there is no reason not to expand on it or develop it further on other sites. As part of your outreach, think of your original content as the “hub”, and guest posts as the individual “spokes”. Each guest post you write can be connected to the original piece on your blog, helping you to create additional content and drive traffic back to your site. A piece of content on our blog that has recently worked well as a “hub” is a post including Expert Opinions on the Digital Trends of 2015. Breaking down these trends we have now created some “spoke” posts to place on other industry sites such as Smart Insights and Content Marketing Institute. This is a great strategy, as it extends the lives of your bests posts and allows you to create high quality “spokes” on a topic you already have a good understanding of. It will also increase your SEO through the high quality relevant links. As you can see, there are tons of brilliant ways to repurpose old content and breathe new life into it. There are many different benefits of recycling your old blog posts and articles and it is amazing how far one idea can take you. Before you create your next piece of content, take a step back and think about how it can be re-purposed. Consider the various content formats available, how many social channels you have to promote the content and the different audiences that you want to reach.